Reservations should be booked at least one week prior to your scheduled visit. All on-line reservations will be confirmed by phone. While the museum will attempt to accommodate all drop-in tours, we cannot guarantee that enough staff will be available without a confirmed reservation. Group tours of 15 or more receive a $2 admission discount ($8 for regular, $6 for senior, members are free) Reservations are required for docent-led tours and are scheduled on a first come, first serve basis. Curator’s tours, and special subject tours, are available for groups up to 15 for a $2 admission discount ($8 for regular, $6 for senior, members are free) plus an $80 charge. Based on staff availability; reservations are mandatory. School tours and children’s groups, along with their adult supervisors, are free. Based on staff availability; reservations are mandatory. For specific descriptions of our school tour offerings,please visit our school tour page. 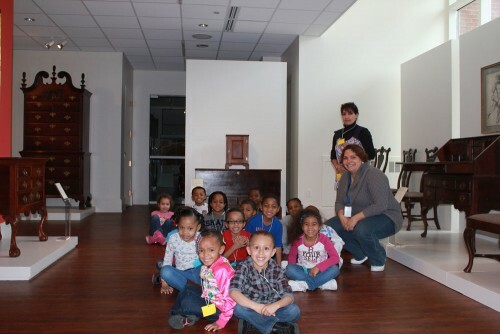 To make a reservation or ask questions by phone, please contact Curator of Education Regina Lynch at 302.674.2111 x 110 or rlynch@biggsmuseum.org.